Unique access to stunning unmarked mountains. 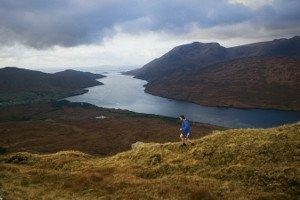 Come and challenge yourself against the magnificent wilds of Connemara. You must be an experienced mountain runner to enter the 22km Expert or 12km Intermediate Events and over 18 years of age on the day of the race to enter. IMPORTANT: Please read the entry requirements before you decide to enter the Gaelforce Mountain Run. This race will appeal to experienced mountain runners and also those who are of reasonable fitness and want to take part in a mountain run for the first time. The route will take runners through the northern Maamturk Mountains and along part of the Western Way. There is very little trail involved but the course will be way marked which will allow first-timers the opportunity to try mountain running. The scenery is breath-taking and the ruggedness of the area will add to the challenge the participants face. After the race participants will be greeted at Killary Adventure Centre with homemade soup and a special event t-shirt.